“Building a platform ahead of engaging with the audience on an idea is like putting the cart before the horse.” Power to the Pixel CEO Liz Rosenthal gives the low-down on The Conference. 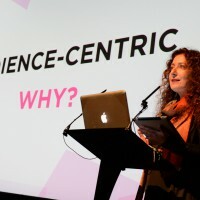 Prototyping and the art of connecting with audiences early on in a project’s genesis will be at the heart of Power to the Pixel’s The Conference this year, unfolding October 13 at the BFI Southbank. “Prototyping is a way of both seeing whether an idea has traction and engaging with audiences from the start,” says Power to the Pixel Founder and CEO Liz Rosenthal. “A lot of media companies are not doing this. They choose the product or distribution format first but building a platform ahead of engaging with the audience on an idea is like putting the cart before the horse. 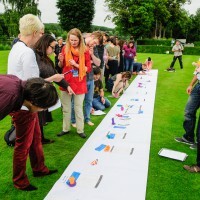 To give a taster of what prototyping entails, digital storytelling pioneer Lance Weiler and interactive games expert Nick Fortugno, COO of New York-based Playmatics, will kick-off The Conference with a live prototyping lab revolving around their ambitious global project Sherlock Holmes and the Internet of Things – http://sherlockholmes.io/ – a collaborative storytelling experience in which groups of players participate in a connected crime scene. The work was created over the course of a year with hundreds of collaborators hailing from 30 countries, including participants in a Massive Open Online Course (MOOC) run by Columbia University where Weiler is currently Director of its Digital Storytelling Lab. “For Lance, prototyping is all about bringing people in to try out and work with ideas which in turn builds traction for those very ideas,” says Rosenthal. The focus on prototyping will feed into a wider discussion throughout the day on how audiences are increasingly involved in content creation as co-creators, financiers, curators, marketers and distributors and how this can be incorporated into the development and production chain from the start. Jon Leland, Director of Strategy and Insights at crowd-funding platform Kickstarter, will talk about how a combination of “empathy and data” can build a community around a project. “For me, crowd-funding is not just about the money, it’s prototyping in a way. A Kickstarter campaign is a way of seeing whether an idea has traction with people,” says Rosenthal. “What you do with that community afterwards is one of the big issues for people who use crowd-funding. It’s time-consuming building a campaign and then keeping supporters on board as your advocates all the way through a project but this can be one of the most valuable things you do,” she adds. In one of the most successful examples of this to date, Marc Beaudet, CEO of Montreal-based digital production house Turbulent, will speak about his company’s experiences working on Star Citizen, a space simulator game financed through one of the most successful crowd-funding campaigns in history. Turbulent is a partner on the project, spearheaded by famed games designer Chris Roberts, which has raised $90m since 2012 from more than 750,000 backers through a sophisticated platform involving game enthusiasts in the development of the game as well as tapping them for donations. Although the actual game has yet to go live, it already has hundreds of thousands of fans. Donors are rewarded with spaceships and credits to buy additional equipment in the simulated space world once the game goes properly live. “They’ve created a platform which enables the community not just to donate but also to design and iterate with the developers and then collects the feedback and data around that community – it’s an incredibly powerful system that could be applied to almost any project,” says Rosenthal. Data will be a leitmotif running throughout The Conference. Daniel Singer, CEO of London-based digital marketing and data research specialist Mavens, will talk about how his company collates data – including consumer reviews, app store data, funding history and commercial performance – to help companies identify and connect with audiences for an idea from the outset. “They call themselves a digital marketing agency but what Mavens does goes way beyond that. They’re employed by companies to research how they can grow their brands through the data they can find and research around consumers and audiences,” says Rosenthal. 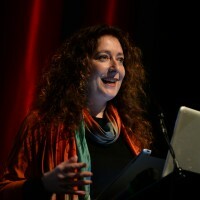 In another data-related talk, Catalina Briceño, Director of Industry and Market Trends at the Canada Media Fund, will examine how the advertising world’s use of programmatics – or buying and selling advertising space using computer algorithms – is trickling through to how and what media content is delivered online. “Programmatics is a huge business within advertising based on people’s online behaviour. Catalina will look at whether we’ll be delivering media like that in the future and how it will affect what we do curatively and editorially. It’s a huge question,” says Rosenthal. In an example of a company using a data-led approach, Rose Adkins, Founder and CEO of ScreenHits, an online platform screening and selling TV and film content to consumer and B2B markets, will talk about how her company helps producers pilot and develop content through audience and B2B responses. Touching directly on the topic of prototyping, Ingrid Kopp, Senior Consultant at the interactive department of the Tribeca Film Institute, will give a talk entitled Prototyping the Organisation, while Hugues Sweeney, Head of French Language Interactive Media Production at the National Film Board of Canada, will discuss how the Montreal-based digital studio he runs is increasingly taking a prototyping approach. Beyond the central focus on prototyping, Margaux Missika, Executive Producer Paris-based digital production house Upian, will discuss whether international co-productions are the future of interactive storytelling, and Alex Ayling, Head of BBC Worldwide Digital Studios, will talk about the challenges of bringing the world’s oldest broadcaster into the digital age. There will also be a sidebar on virtual reality and how it is impacting storytelling which will featuring Saschka Unseld, Creative Director of Oculus Story Studios, Alex Bowker, Developer Relations Lead at Samsung Electronics, Dave Ranyard, Sony London Studio Director at Sony and Gabo Arora, a Senior Advisor and Filmmaker at the United Nations who has been pushing the boundaries of virtual reality content with humanitarian works including Clouds Over Sidra capturing the reality of a young girl living in a Syrian refugee camp in Jordan. Tickets are still available for The Conference (13 Oct) and The Pixel Market Finance Forum (14 Oct) here.